Yesterday I shared with you our plans for Blake's christening in July. Today thanks to getting personal I am going to show you two lovely alternative christening gift ideas. When it comes to christening's most people buy traditional items such as a bible and silver items such as money boxes, silver spoons etc. items that are a bit different and not just traditional. First up is the "Little Star" Blue text token. This little token is made from polished glass which features the message "Little Star"
along side a cute blue star design. It comes in its own little presentation box so that you can keep it safe. I love this and am adding it to Blake's memory box for when he is older. If you would like me to do a post on what I have in Blake's memory box so far. Than comment below, I've had such fun adding bits to it so am happy to show you all if your interested. Next is the most cutest personalized Oak wooden toy. I love, love, love this little toy it's such a special little gift. I think it is an ideal alternative christening gift. I can imagine that this will bring Blake hours of fun when he is a little bit older. Fixed to it's feet it has four chunky white balls meaning that the elephant can be pushed around. You can even tie a piece of string through the elephants eye so it can be pulled along. The elephant is handmade from durable solid oak, sourced from sustainable forests and finished off with Danish oil. You can add a lovely touch to the toy by getting the toy personalized with any name. 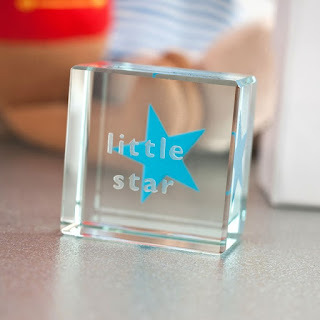 It's an item that will give your little one hours of fun and then serve as family heirloom for many years to come. What do you think of these alternative christening gift ideas?